ItemI-58265 - Oil claim survey, Flathead; survey crew at Beaver Lake. ItemI-58266 - Oil claim survey , Flathead, camp Kishe-neh-na. ItemI-58267 - Chainman Tom Watt wading Sage Creek, Flathead Valley. ItemI-58268 - Canadian Pacific Railway Empress liner in Vancouver. ItemI-58269 - "Falls, Long Lake River, Fort McLeod Trail"; McLeod Lake. ItemI-58271 - Bull River traverse, felling trees to bridge the river. ItemI-58272 - Bull River traverse, chopping out a "jackpot". ItemI-58273 - Bull River traverse, chopping out a "jackpot". 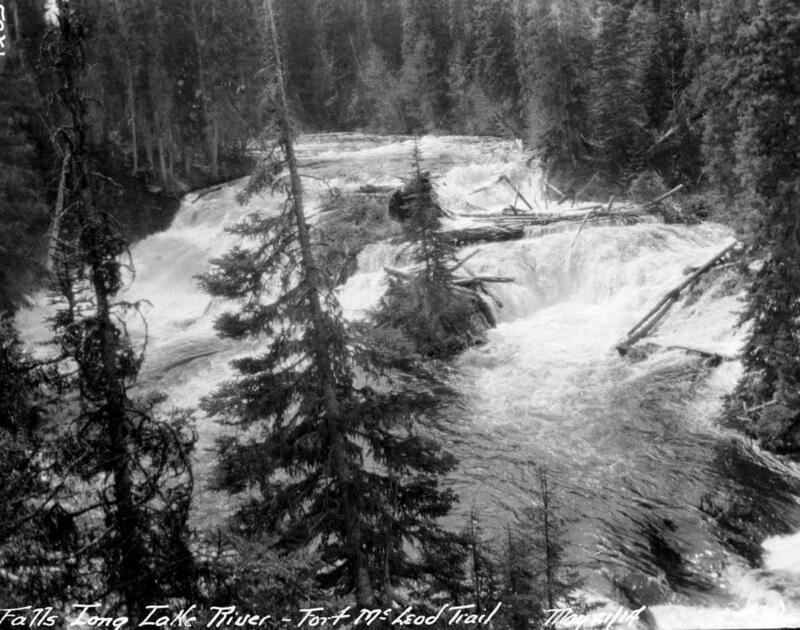 Item I-58269 - "Falls, Long Lake River, Fort McLeod Trail"; McLeod Lake. "Falls, Long Lake River, Fort McLeod Trail"; McLeod Lake.